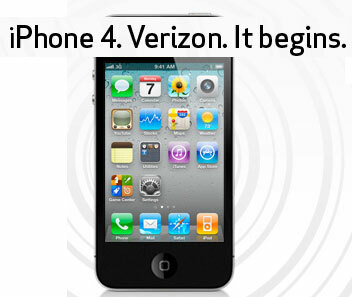 After years of AT&T exclusivity, Apple iPhones are finally available for Verizon Wireless customers. Preorders for existing customers start today with phones available for new customer purchases starting in a week. Early reviews report that the VZ iPhone offers better call signal quality than AT&T’s version but lags a bit behind in download speeds. Since the VZ version is a variant of the current iPhone 4 model, there really shouldn’t be any surprises or early glitches. Unless you MUST have an iPhone right away, you might want to wait a few months since the iPhone 5 is expected to be released this summer. It’s interesting to see it released on Verizon, but for those who’d jump ship and would pay the early termination fee (or for those already on Verizon and wanting an iPhone) I’d also suggest waiting. Not only will the iPhone 5 come out around June, but the announcement for it will be coming out shortly—and that means near immediate price cuts on the iPhone 4.